Over the past FLL season, seven Neutrinos mentored four Ames Middle School FLL teams. Mentors started meeting with the teams midway through their season. In this volunteering opportunity, we worked hard to give the teams guidance and advice about programming, robot design, the project, presentation, and core values. 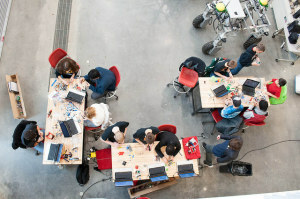 The teams were better prepared for their competition this year, and so three teams won an award and one team qualified for the Iowa State Championships. This program took our team’s outreach to the next level because prior to this fall, our team had not mentored FLL teams this closely. With this program, we were able to work with them more often and more in depth. About forty students in FLL were impacted, and we volunteered for a total of about 113 hours. The mentoring program concluded with us attending their regional competition at Maxwell-Collins. 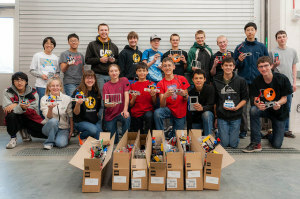 Yesterday, twenty Neutrinos and mentors gathered to assemble FIRST Lego League mission models that will be used in Iowa Regionals and the State Championship. In total, We made about eight kits. We are excited to volunteer on December 13 at the FLL regional at the Science Center of Iowa. On Saturday, our team will build five to ten Mission Model kits for the First Lego League competitions at Iowa State. Through this activity, our team will help out the FLL program that inspires the next generation of scientists and engineers. Our second day of the competitions went surprisingly well. We began the day by fixing our robot and performed well in some of our matches. We won two of our matches, but ended out being ranked lowly. During alliance selection, we were surprised to be picked as the second robot on the Eighth Seed alliance. Thanks to the Baxter Bomb Squad, the Cel-Techs, and Cougar Robotics for providing an excellent alliance to play with until the semifinals! Today has certainly been an exciting day! Due to technical difficulties, we left the competition ranked 37 with one win and three losses. Tomorrow, we hope to do better after repairing some problems with amperage and shooter tension. Be sure to cheer us on tomorrow. Even if we don’t win, we have certainly learned much that will help us next year!